Hello everyone, this is Jennifer Ramos from Made By Girl. I'm excited to be the guest blogger here at decor8 today! I'm the designer and owner of an online shop called MadeByGirl.com based out of Henderson, Nevada. We sell fun & colorful greeting cards (printed on 100% recycled paper) as well as many colorful posters. I decided to start the cards and poster business as a means of expressing myself and hopefully inspiring others to start implementing a more environmentally friendly way of conducting business. I don't believe your every move has to be a green one, but one or two things you do, are one or two things less damaging to our earth. Ok, enough GREEN talk for now, and on to my picks of BEAUTIFUL BEDROOMS that make you want to get up and start redecorating yours as soon as possible! First is this silver wallpaper bedroom from Living Etc. This bedroom appeals to me in so many ways. The first word I think of is Glamorous and extremely feminine. I love how the silver wallpaper just brings this room to life along with the artwork of the cartoon glitter girl. The floor seems dull but barely noticeable due to all the reflective surfaces & vibrant accessories. Next is the black wall Goth-Glam bedroom, also from Living Etc. The black walls behind the massive headboard give this room a slightly gothic but glam feel. Even though one wall is painted very dark, the room still remains very bright. This is because of the large windows, the mirror on the dresser door and the light color used for the bed sheets. Design tip: Contrast provides an interesting visual appeal, but you have to be sure to offset the dark walls with plenty of light or bright colors. I also like this bookshelf behind the bed via Marie Claire Maison. The bedroom in this photo has always reminded me of a small apartment I had when I lived in New York City. It's small but cozy and the bookshelf behind the bed gives it a sense of height. They use an interesting mix of modern and antique styles such as the gilded frame surrounded by Christmas lights and the IKEA locker at the foot of the bed for storage. Now for something girly... How about the patchwork quilt bedroom as seen over at Mi Casa Revista? This room is full of vibrant colors that extend from the bed to the walls. The turquoise wallpaper is such an important part of the decor here, it compliments the dresser and the bed sheets. There is a consistent theme and use of color but the colors aren't overdone. Seems almost comforting to me. With stark white walls, this bedroom is decorated with mismatched frames and a variety of styles. The analogous color scheme draws the eyes to the artwork and the different types of patterns used on the fabrics on the bed. 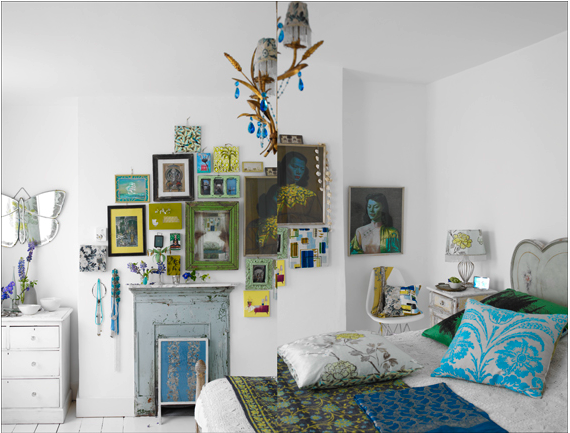 This room is in the home of Liza Giles who works as a senior stylist for Designers Guild and it is one of my favorites. This image is from Inside Out Magazine photographed by James Merrell. See more of this Giles' home right here. An off white bedroom can appeal to both sexes quite well. The height of the room adds to its grandeur. White brick walls have always been a favorite of mine and is very reminiscent of a loft I lived in when I was in NYC. Decor for this bedroom is subdued and relaxing, even the disco-ball styled lamp is off white which prevents if from standing out too much. Image via: New York Magazine. I'm such a sucker for tufted headboards and this one is no exception. Kelly Wearstler designed this space with exceptional symmetry. I like how the mirrors are placed over the side dressers and the boxed frame over the bed gives this room a sophisticated and luxurious feel. Even though this room is is all white, the artwork and its colors really bring it to life. You can use the colors in your artwork as a guide to bring in other accessories with similar colors, such as pillows, lamps and in this case a turquoise dresser. Via: Living Etc. Bonus Image! My (Jennifer) Bedroom! My own bedroom was easy since I knew what I wanted. 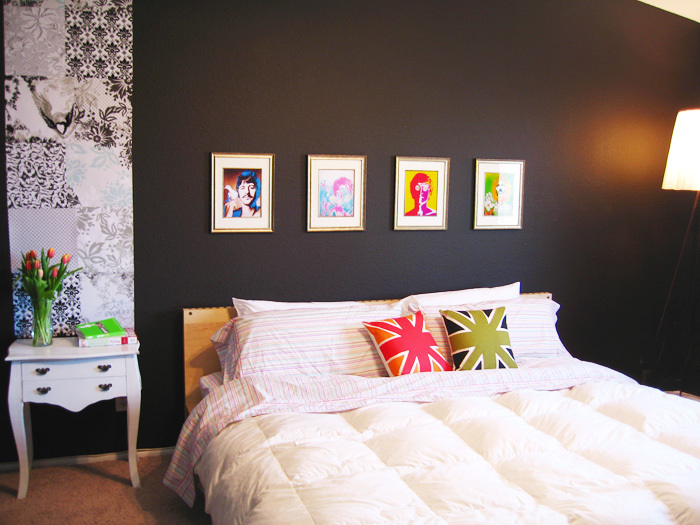 I love the use of bright colors as accents, so the pillows and the Beatles pictures made sense together. The theme was slightly rock 'n roll but still sophisticated and stylish. The wallpaper running from behind the side dresser to the top of the ceiling are actually from a scrapbook. They were glued together and tacked onto the dark charcoal wall. - Jennifer from Made By Girl. A Fine Line: Inspiration or Imitation?